The People's Republic of China is located in East Asia. It is the third largest country in the world with a total area of 9,596,961 km2 (3,705,407 square miles). It is the largest country in the world in terms of population, with a 2012 estimated population of 1,350,695,000. The history of China goes back to the ancient civilization that flourished in the fertile basin of the Yellow River in the North China Plain. For millennia, China's political system was based on hereditary monarchies, known as dynasties, beginning with the semi-mythological Xia (ca. 2000 BCE). The Republic of China (ROC) overthrew the last dynasty in 1911, and ruled the Chinese mainland until 1949. After the defeat of the Empire of Japan in World War II, the Communist Party defeated the nationalist Kuomintang in mainland China and established the People's Republic of China in Beijing on 1 October 1949. Since the introduction of economic reforms in 1978, China has become one of the world's fastest-growing major economies. China officially recognizes 56 distinct ethnic groups, the largest of which are the Han Chinese, who constitute about 91.51% of the total population. China's three traditional religions include Confucianism, Buddhism, and Taoism. According to a study by the Pew Research Center of Global Religious Landscape as of 2010, 21.9% of the population in China are folk religionists, 18.2% are Buddhist, 5.1% are Christians, 1.8% are Muslims, 0.8% are of other religions, while unaffiliated constitutes 52.2% of the population. The first Mennonite missionaries to enter China were sent out from the United States in the 1890's but served under non-Mennonite boards. Mission work under Mennonite boards began after 1900 and may be summarized under six heads, viz., the China Mennonite Mission Society, the China Mission of the General Conference Mennonites, the South China and West China Missions of the Mennonite Brethren, the Mongolia Mission of the Krimmer Mennonite Brethren, and the postwar attempts of the United Missionary Society and the Mennonites (Mennonite Church) to establish new work. The China Mennonite Mission Society operated from 1905 until 1946, when the Society was dissolved and its work taken over by the participating groups, the Mennonite Brethren and Krimmer Mennonite Brethren taking responsibility for the western field in Szechwan-Kansu and the Evangelical Mennonite Brethren in Shantung-Honan. The China Mission of the General Conference Mennonites was begun as an independent venture by Henry J. and Maria Brown in 1909, and in 1911 was located at Kai chow (Puyang), Hopei. In 1914 this work was taken over by the Foreign Mission Board of the General Conference and additional workers sent out. By 1920 there were 14 missionaries on the field, primary school work had been started, and a large church building completed at Kai-chow. The field expanded to include all of the tip of Hopei province south of Ta-ming, an area 100 miles long and 40 miles wide with a population of 2 1/4 million. In this field were seven major centers with buildings erected by foreign funds. Mennonite Encyclopedia, v. 1, p. 561. Evangelistic work was carried on from the beginning with Chinese evangelists assisting in outstations, traveling work, instruction classes, and as colporteurs and Bible women. Educational work included full primary work at the seven centers and lower primary at a number of other places. Boarding schools were opened at Kai chow and Taming, the former developing eventually into a full senior high school. Medical work began with a dispensary at Kai chow which grew to become an 80-bed institution with outstation clinic work and a well-developed school of nursing. The mission had its last normal year in 1940. In the following two years all missionaries either evacuated or were interned. There were at that time 2,273 communicants in 24 organized churches and 40 preaching places. The churches and missionaries had organized in 1938 a Field Conference with a General Committee for administrative purposes. This organization took over the work during the war and after the Communist occupation. There was little contact in the 1950s, but reports showed continued activity. After the close of the war eleven missionaries returned to China. Due to ensuing civil war the work was interrupted and they were forced to move, working successively at Kaifeng, Honan; Paoki, Shensi; and Chengdu, Szechwan. As Communist control was established, it became increasingly difficult for foreign missionaries to work and many found it advisable to leave the country. By 1950 only four of the eleven remained. Two of these were granted exit permits and left in February 1951. The other two, P. J. Boehr and wife, were detained on account of accusations against him. He was arrested and subjected to house imprisonment, and was finally escorted from the country in May 1951. Mrs. Boehr followed shortly after. The Mennonite Brethren of America participated in the work of the China Mennonite Mission Society and provided perhaps a dozen workers through the years. The South China Mission, however, was the first that came to be formally sponsored by the church. It was started independently by Mr. and Mrs. F. J. Wiens in 1911 among the Hakkas at Shanhang in Fukien province. The home church was interested from the beginning and in 1919 accepted conference responsibility for the mission. Six new missionaries were sent out in the next two years and more later. Evangelistic work, schools for boys and women, and a Bible School for training evangelists were conducted. In 1921, 450 members were reported, also 11 outstations manned by Chinese evangelists and 17 schools with 30 teachers. Recurrent political unrest caused the evacuation of the missionaries in 1927. Although return was attempted in 1929 it was unsuccessful. Again in 1933 work was attempted but with only limited success. In 1947 Roland Wiens, son of the founder, and his wife returned for a third attempt. In spite of lack of communications, difficulty of money exchange, and Communist occupation, the couple remained until May 1951, when they left the field for Hong Kong and were transferred to work in Japan. 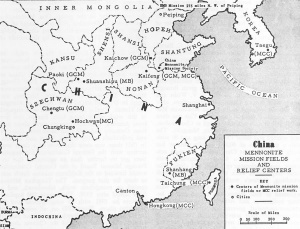 The West China Mission of the Mennonite Brethren came about through the dissolution of the China Mennonite Mission Society in 1946, at which time the Mennonite Brethren accepted responsibility for work that the Society had started on the Szechwan-Kansu border. Eight missionaries were sent out after the war for a short period of active work, but all found it necessary to return. The last to leave was H. C. Bartel, who was the founder of Mennonite work in China. He traveled to the coast and returned home in May 1952. H. C. Bartel, the founder of the China Mennonite Mission, was from this group and went to China as early as 1901. Others from the Krimmer Mennonite Brethren (KMB) also worked under the same Society; as many as 13 were serving in 1922. Though the KMB Church was never officially connected with it, regular support was given through individual contributors. In 1922 F. V. Wiebe and family were sent to China with instructions, after learning the language at the China Mennonite Mission, to begin a work of their own. This was done in 1923 when a station was opened at Cho-tze-shan, a city of 4,000 in Suiyuan province, Mongolia. The field selected was about 150 miles (240 km) long and 50 (80 km) wide with a population of 60,000, largely Chinese but partly Mongolian. At Cho-tze-shan, the main center, the mission had a 4 1/2-acre compound with homes, church, elementary school, and clinic. The major emphasis in work was on evangelism, with preaching, women's work, colportage, outstation meetings, and instruction classes. Churches were organized at four centers and encouraged to become indigenous and self-supporting. Under the Japanese-sponsored government missionaries were welcomed but their activities much restricted. A total of 16 missionaries served on the field between 1923 and World War II. After the war four missionaries went back to the field and in 1947 organized the Chinese Christian Church Conference. Due to disturbed conditions the missionaries had all returned home by 1949 and work continued as possible under the Chinese. This is the mission board of the Mennonite Brethren in Christ who, after 1948, were officially known as the United Missionary Church. Their first missionaries, William Shantz and C. F. Snyder, went out to China in 1895 and 1897 under the Christian and Missionary Alliance. In 1923 Bessie Cordell was sent to China under the National Holiness Association though supported largely by her own group. After World War II Miss Cordell was located at Tientsin and became interested in orphan children. She proposed that her church start missionary work with an orphanage. This was approved in 1948 and work begun. It was barely started before Communist occupation caused the evacuation of Miss Cordell and the work was left in Chinese hands. In 1942 the matter of opening work in China was discussed at the annual mission board meeting of the Mennonites (MC) but action delayed until after the war. The board secretary made an investigation of the field in 1946 with recommendations and the following year a party of five sailed for China. After a year of language study work was opened in the area centering about Hochwan, Szechwan. Communist movements, however, so restricted the activities that missionaries were withdrawn to Chengdu in 1950 and their evacuation requested by the board. One of the group, Don McCammon, was arrested in December 1950 on a charge of disrespect to the new government and after a public trial deported. The rest also left by the middle of 1951. With the defeat of the Kuomintung movement and the establishment of the People's Republic of China in 1950, Chinese Mennonite churches found themselves in a totally new situation. Virtually all Mennonite missionaries and relief personnel left China by 1951. Chinese authorities permitted the churches to meet according to established customs but not for long. Church properties were confiscated and with the coming of the Cultural Revolution in 1965 virtually all traces of the churches were erased, even though some Mennonites remained Christian in conviction and personal piety. Virtually no direct communication between North American mission boards and Chinese Christians was possible until the Cultural Revolution came to a close in 1978. However a new and exciting chapter in Mennonite-Chinese relations began in 1979. In that year, Goshen College negotiated an educational exchange with the Sichuan Provincial Bureau of Higher Education. It was the first exchange between a Chinese university and an American undergraduate college since Liberation. Accordingly, 20 Goshen College students spent 16 weeks at the Sichuan Provincial Teacher's College in 1980 while 10 Chinese teachers of English from Sichuan Province spent the 1980-81 academic year at Goshen College studying English pedagogy. Exchanges continued on an annual basis. By 1987, 160 Goshen students had spent a Study-Service-Trimester in Chengdu while some 70 Chinese teachers of English had studied at Goshen College. Since China had been virtually closed to American visitors before 1978, a book entitled The New China (1982) by Winifred Beechy, helped the Mennonite Church as well as the broader reading public to understand China's life and culture under socialism. (Winifred and Atlee Beechy led the 1978 Goshen College contingent.) Goshen College also provided teachers of English for the North-East Institute of Science and Technology at Shenyang in Laoning Province. Chinese officials and American Mennonite medical doctors, agricultural experts, and educators exchanged visits annually. The initial success of the Goshen College program led in 1980 to a general invitation for the Mennonite churches to supply China with as many qualified teachers of English as possible. In order to meet this unusual challenge, various branches of the Mennonites organized in 1980 the China Educational Committee, with Bert Lobe of Mennonite Central Committee as director. In 1981 two North American teachers were sent to Sichuan Province. The numbers increased gradually. By 1986 a total of 52 North Americans had participated in the exchange. Eastern Mennonite College and Bethel College (Kansas, USA), hosted Chinese teachers. Brown, H. J. Chips of Experiences. N.p., n.d.
Brown, H. J. In Japanese Hands. North Newton, 1943. Kaufman, Ed. G. The Development of the Missionary and Philanthropic Interest Among Mennonites. Berne, IN, 1931. Lohrenz, J. H. The Mennonite Brethren Church. Hillsboro, 1950. McCammon, Dorothy. We Tried to Stay. Scottdale, 1953. Mennonite Weekly Review (23 August 1984): 6; (30 August 1984): 6. Peters, G. W. The Growth of Foreign Missions in the Mennonite Brethren Church. Hillsboro, 1952. Ramseyer, Robert and Alice. Mennonites in China. China Educational Exchange, 1988. Storms, Everek R. What God Hath Wrought. Springfield, 1948. Wikipedia. "Religion in China." 11 May 2014. Web. 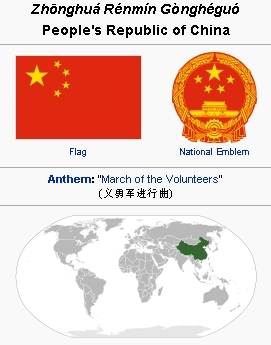 13 May 2014. https://en.wikipedia.org/wiki/Religion_in_China. Pannabecker, Samuel F. and J. Lawrence Burkholder. "China, People's Republic of." Global Anabaptist Mennonite Encyclopedia Online. 1987. Web. 26 Apr 2019. http://gameo.org/index.php?title=China,_People%27s_Republic_of&oldid=134705. Pannabecker, Samuel F. and J. Lawrence Burkholder. (1987). China, People's Republic of. Global Anabaptist Mennonite Encyclopedia Online. Retrieved 26 April 2019, from http://gameo.org/index.php?title=China,_People%27s_Republic_of&oldid=134705. Adapted by permission of Herald Press, Harrisonburg, Virginia, from Mennonite Encyclopedia, Vol. 1, pp. 560-562; v. 5, p. 690. All rights reserved. This page was last modified on 23 June 2016, at 11:56.